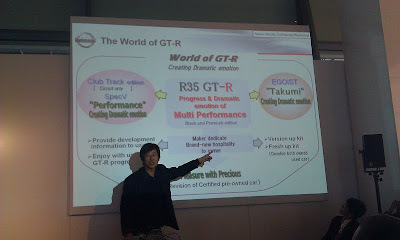 Discoragno and theItalian GTR club posted several pictures, along with some information about the 2013 Nissan GT-R at NAGTROC. It looks like this might be a fairly significant change from the 2012 - DBA edition. Nothing too major in the exterior features, but transmission, engine, intake, exhaust, and aero changes. There are several models, undergoing testing as far as we can figure out. One is similar to the Japan only Club Track edition on slicks, and the other would be the standard 2013(US) Nissan GT-R.
From the rumors, the power on the standard car gets bumped to 570 horsepower. To get the 40 horsepower increase over the 2012 model, their are changes to boost pressure, the intake, and the exhaust. In addition to the power, Nissan has managed to lower C02 emissions. More power, more green. Tree huggers rejoice, and buy a LEAF. Slicks. Will they show a track edition Nurburgring lap time? Its interesting they brought the track edition to Nurburgring. Nissan want want to show exactly how quick they can make a Nissan GT-R go on a real slick. None of this "cut slick" old rumor thing. They say visually there will be no changes to the 2013 model. They also mention that the Premium, Black Edition, and Egoist will be offered worldwide. I wonder if worldwide means everywhere but the US? Track Edition front lip and undertray. At least that is what we think it is. The track edition has a nice new carbon fiber front undertray with ducts and air deflectors to the brakes. This might be good for the serious track guys, but like most OEM parts, it will probably be expen$ive. The NAGTROC report says the R35 life cycle should run two more years. In the meanwhile for 2013, there are the underbody aerodynamic changes to improve cooling, suspension and transmission tweaks to improve the overall experience and performance. Where can I find those shoes? The Nissan GTR stand 21 Shoes?